I was very impressed and so excited when they came in. The invitations came out gorgeous and I still had plenty of time to send them off...I will be doing business again with you real soon!! 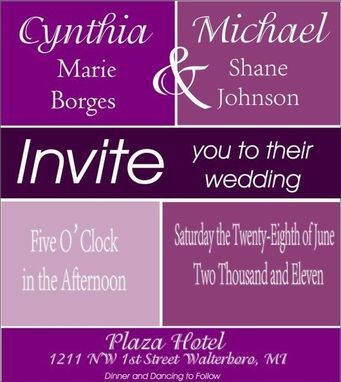 This listing is for 100 wedding invitations in a colorful and modern style. 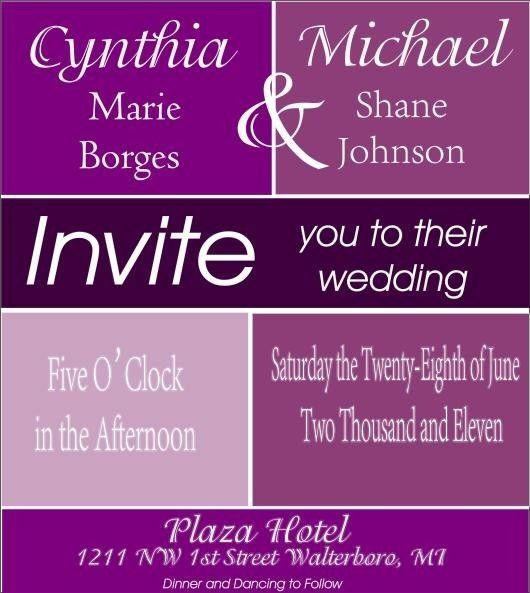 This invitation set is created in a purple colorblock style with white accents and white text. Envelopes for invite and rsvp are included and will be preprinted with your return address. Just a reminder this set can be customized to your color scheme and theme, this is just an idea created to give you ideas when planning your perfect invite. Any other items you may need for your special event. After order is placed and we discuss all the pertinent details and color scheme desired I will produce a digital proof, which I will make revisions until you feel each piece is perfect. Upon final acceptance of proofs please allow 3 to 4 weeks for delivery, now it usually doesn't take that long but just to be on the safe side. If you do need a rush order that can be done, just please convo me prior to purchase so we can discuss those details. This design can also be done in other styles so if you like the design but would like to steer away from a flat card style please convo me and I can show you some other fabulous styles. We are now offering some wonderful new design elements and will have pictures up soon but I am delighted to share them with you, we are doing some wonderful embossing on custom stationery pieces, for example we can emboss a pattern onto the matting layer or do a border around the printed info, we have many designs available and I am working on finding an amazing artist who can do custom embossing folders for me. We are also now offering letterpress - now at this time we are not doing full text letterpress as we are just getting started, but we are doing design elements such as monograms, borderes, flowers, swirls, etc. Custom plates will be made so we can really do just about any design. Please allow for additional time as this is a much more time consuming process, as well as having to have custom plates made. Please drop me an email and we can talk about ideas you may have. The listings you see in my shop are all customizable, and can even be used as jumping off points, an idea to get us started in the direction you envision. Every maker has a story. Be a part of Platinum Designs's story by placing an order, leaving a review, and seeing your review appear here.